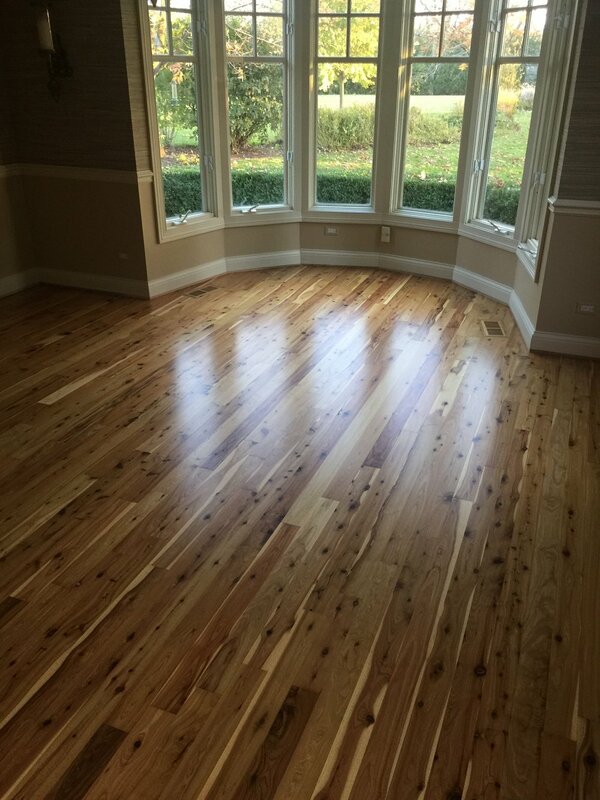 Take a look at some of the hardwood flooring projects that we've done in the past. Below is a collection of some of our more recent projects. We're proud of our work and we'd love for you to take a look. Project Details - This job was for a local customer who wanted something out of the ordinary. She really loved the way the raw flooring looked after we began the refinishing process. 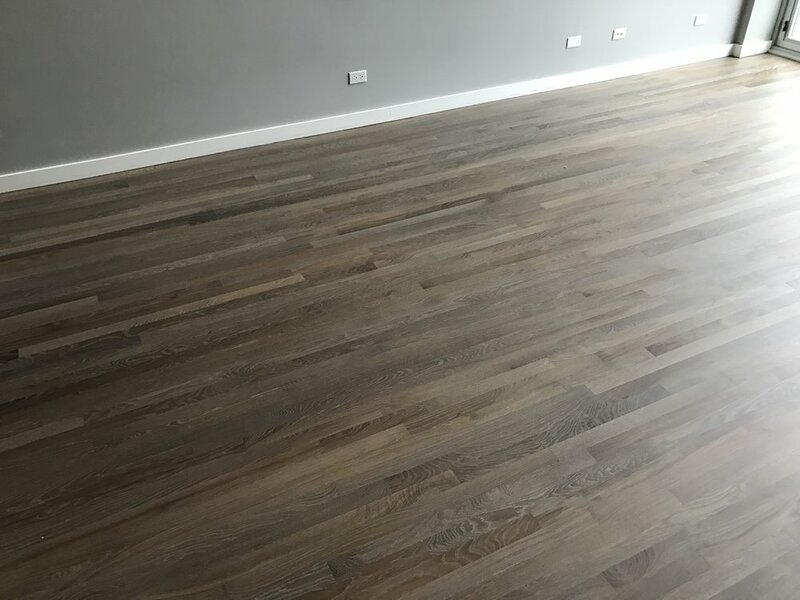 After consulting with her some more about finish options we decided that the best finish would be Loba Invisible, which would give the floors a super matte looking appearance as well as a very light, raw looking color - just like bare wood. Needless to say, the customer was absolutely thrilled! Project Details - This has to have been one one of our favorite projects wrapping up 2016. We were lucky enough to get an awesome customer who wanted something special in his brand new downtown space. 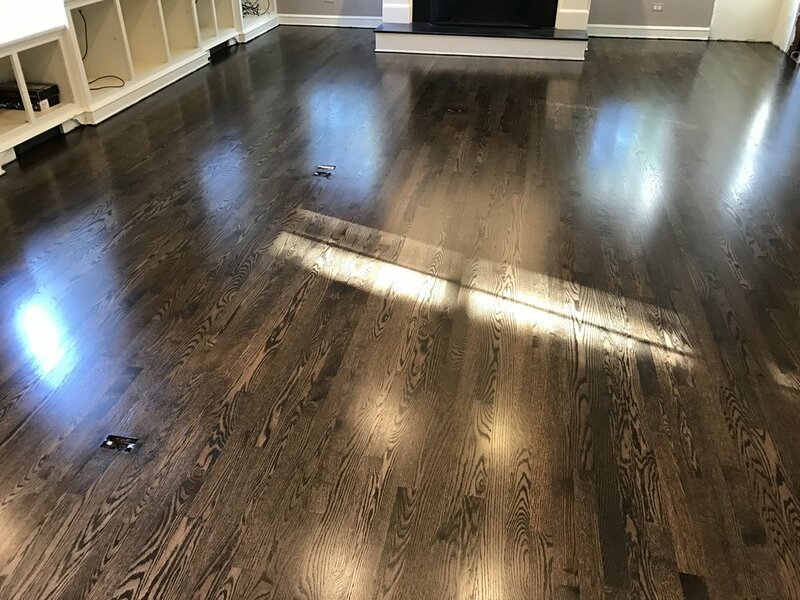 We determined that the best choice of wood was going to be wide plank White Oak hardwood flooring, sanded and finished with Rubio Monocoat Hardwax oil using their two-tone fuming process. Rubio Monocoat Hardwax Oil is becoming very popular amongst customers, and is the highest tier package we offer. It looks incredibly unique and does not build up a film layer on top of the flooring like a traditional finish. See for yourself! This particular color was achieved using Rubio Fume + Rubio Pure 2c Hardwax oil. Project Details - This project was for a local builder who was in a bit of a pinch! 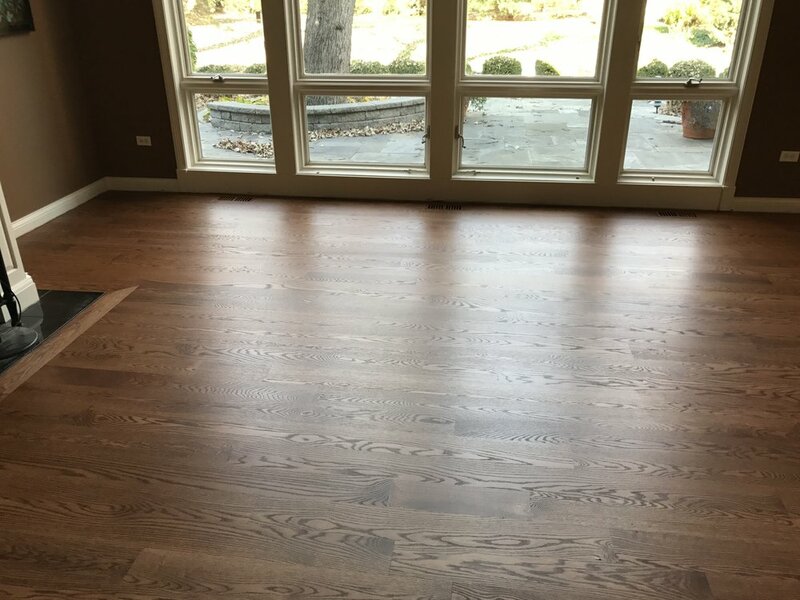 Their go-to flooring company was no longer available so we stepped in to install a beautiful brand new five inch wide red oak hardwood floor. The floor was stained using Provincial to give it that beautiful rich tone that you can see in the photos below. Then, the floor was finished with Loba Hybrid. Loba Hybrid is a cross between oil and water based finishes and we find it to be one of, if not THE most durable hardwood flooring finish on the market today. 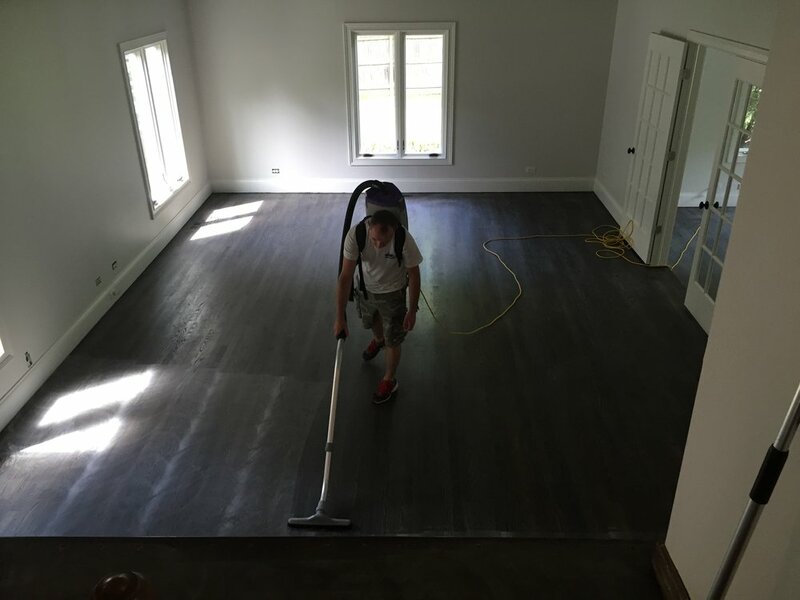 Project Details - A desperate homeowner called and asked us to resand their floors for them. We arrived at the job site and saw what a mess the previous company had left. We got to work right away. The previous company left stain all over the baseboards and walls. The floors themselves had chatter marks all the way across. As icing on the cake, the closets were not even sanded. 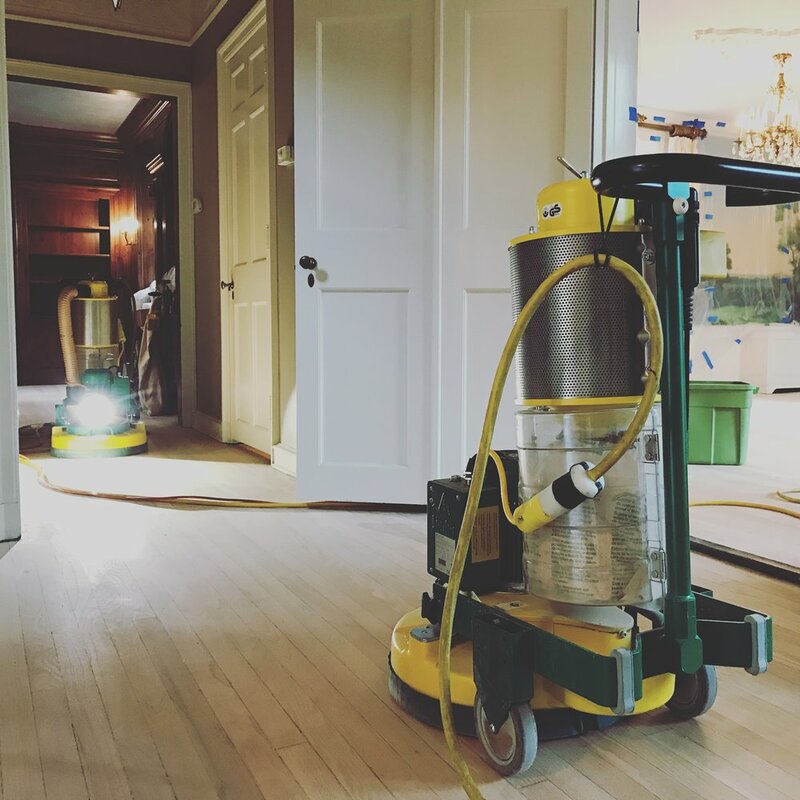 We used our Lagler Trio sanding process so the homeowner could get the very quality floors after the disaster they had to endure. The finishing package chosen for this home was our standard Oil Based finish package and the color chosen was Duraseal Ebony. Project Details - We were very excited about getting this project started! These homeowners really wanted a very unique color as well as finish; something different to make their condo special. The condo was located in Downtown Chicago so heavy fumes were also an issue and we wanted to do our best to avoid them. The customers chose Rubio Monocoat as the finishing process. This is our newest finishing package that we offer and highly recommend. The product is ZERO VOC and has 40+ colors to choose from. 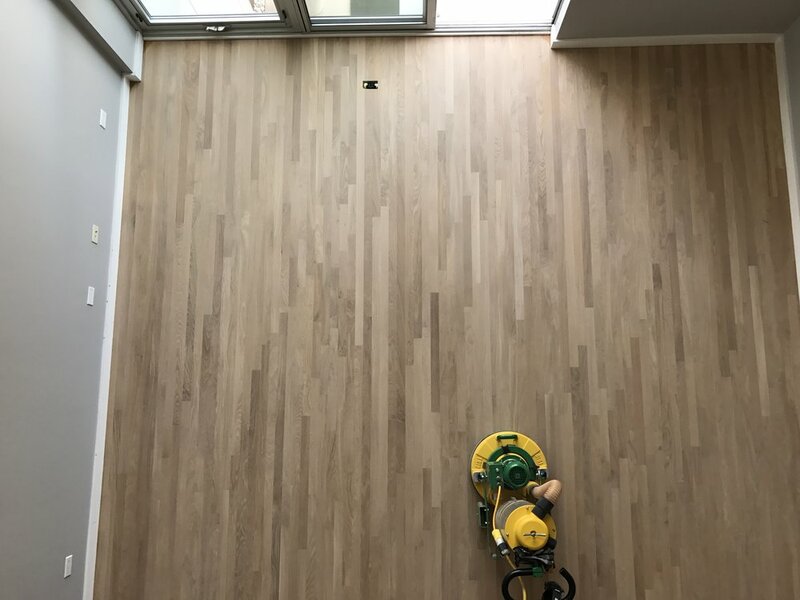 Rubio Monocoat does not act like a traditional finish in a sense that you do not apply it and build up a film layer of finish on top of the wood to protect it. Rubio Monocoat actually gets buffed into the wood so that it can penetrate and strengthen the wood fibers from inside each plank of wood. In doing so, you are also able to choose a variety of colors and processes like Fuming or Smoking the floor before applying the Hardwax Oil. This particular floor was White Oak and the customers chose to do a 50% Fume and 5% White Hardwax Oil. Project Details - This job was very unique and special to us because of the species of wood. Typically here in the Midwest most of what we see is just Red or White Oak Hardwood Floors. However, this customer had an absolutely stunning floor that was made out of Australian Cypress. 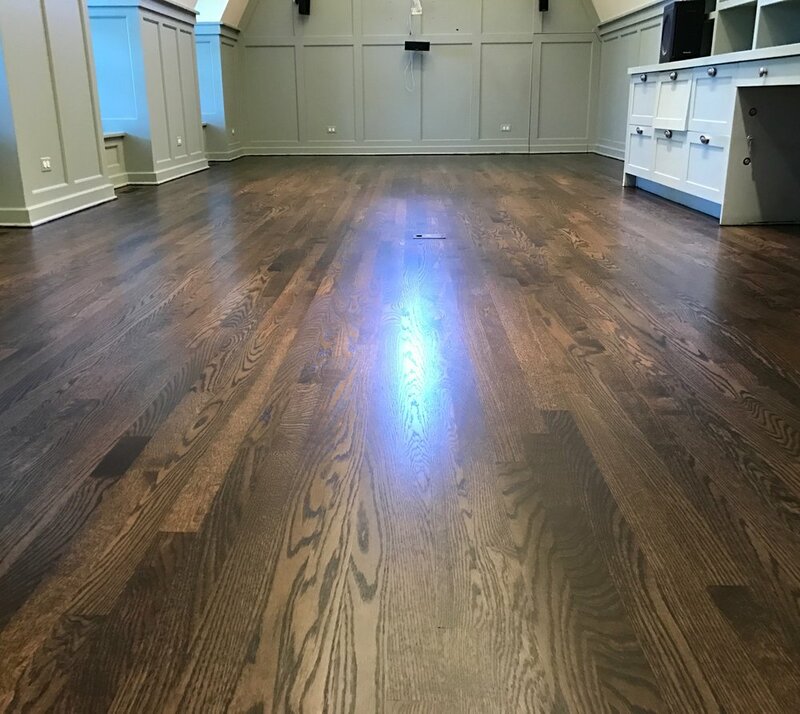 This floor was an absolute pleasure to refinish and turned out incredibly flat due to our Lagler Trio sanding process. This customer wanted an even higher level of protection than our Elite package, so they were upgraded to a two-component water based finish called Loba Supra. Project Details - This particular case was a bit of a disaster for the home owner. We showed up for the estimate and all of her freshly refinished floors were not flat or smooth; they were very wavy, dished out, and sanded improperly. Thankfully, she found our company and hired us to redo them. 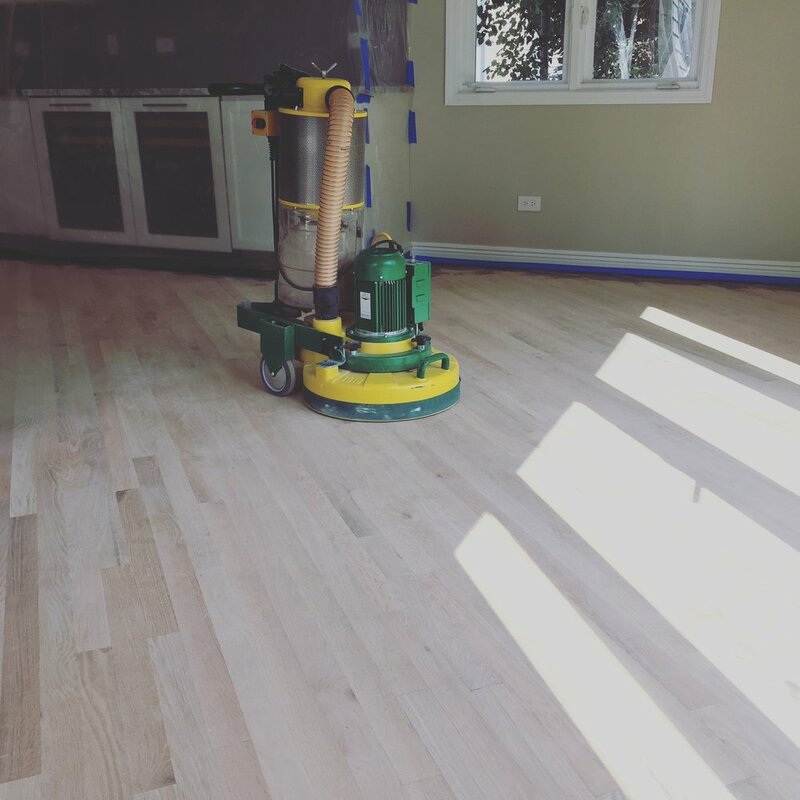 Thanks to our trio sander we were able to get the floor much flatter than any local company in our area would have. She decided to go with the Bona Graphite Stain and the floor was finished with the new water based finish we used called Loba EasyFinish. The graphite really looked nice and showed a lot of gray tones and flowed super well with the kitchen. Project Details - This was a past customer who we've previously done work for. He was so delighted with his floors that he had us come back to remove the carpet on his first floor, and repair the beautiful floor that was hiding underneath it. After some wood repairs and replacements, we refinished the entire space and stained the floor with bona graphite. The floor was finished with our new water based finish called Loba Easyfinish as the customer did not want the color to amber and turn yellow over time like the oil based finish would. The water based finish will not amber over time and is a great candidate for applying over any type of gray colors. Project Details - The customer had just closed on a home, and the entire second floor was carpeted. They really loved the hardwood flooring on the first floor and had wanted the same look upstairs, as well as in one extra room on the first floor, which was also carpet. We removed the carpeting and installed new flooring throughout the entire upstairs. 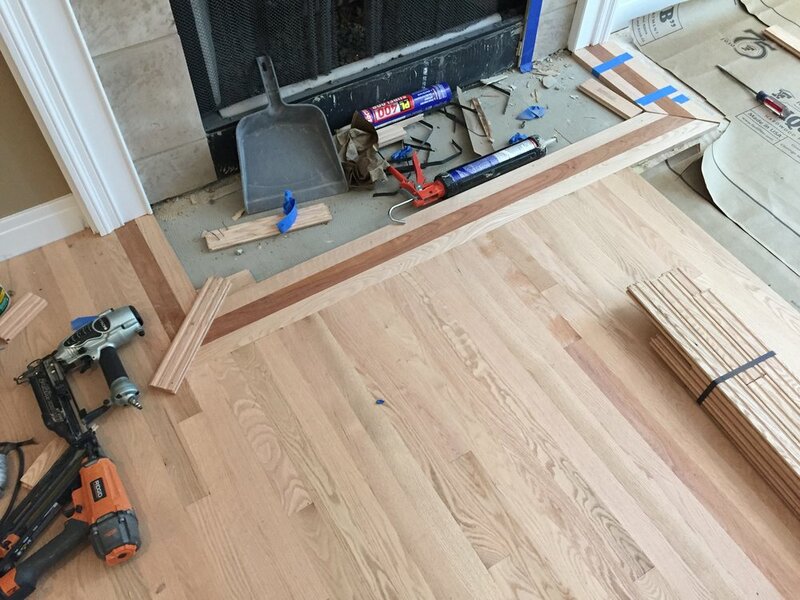 We also installed new Red Oak flooring throughout the one room on the first floor which had a fireplace. We surprised the homeowners with a delightful border around the fire place with a Brazilian Cherry accent in the center of the border. 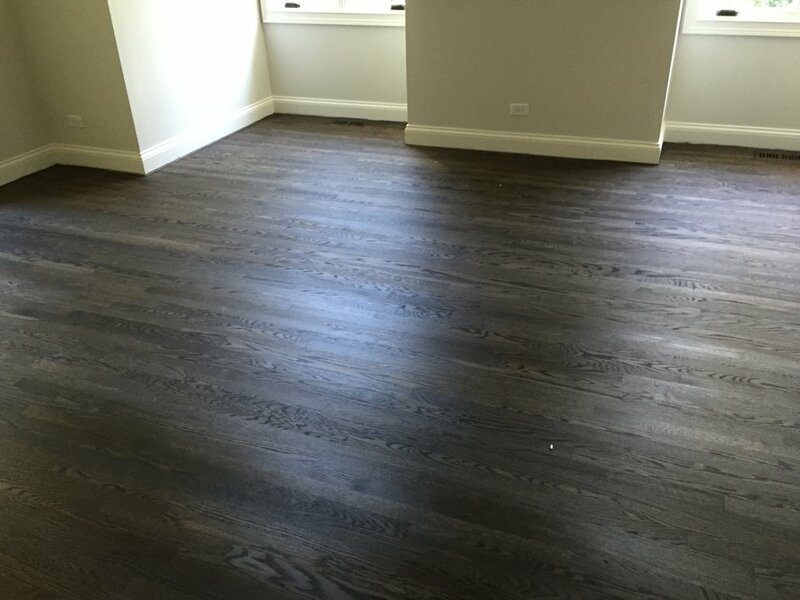 The floors were sanded using our special trio sanding process and finished with the Bona Graphite stain color. They were then coated with our standard oil based finish process. Project Details - Customer had an unfortunate leak in their home. The leak came down the side of a wall and onto the floors. It damaged half of a rooms worth of flooring, so we removed and repaired the damaged flooring and replaced it with new boards. 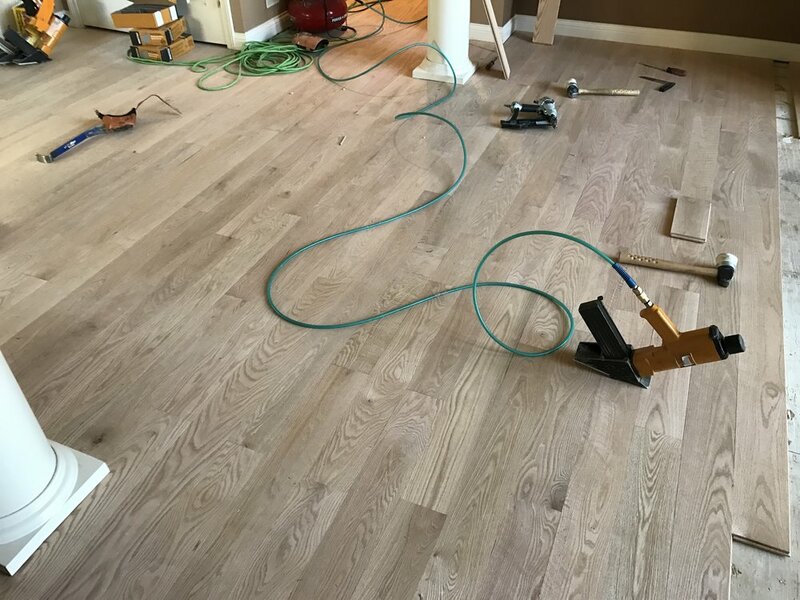 We made sure to tie the new flooring into the old flooring to create a seamless finished product. Due to the job being in the city we had to use water based finish as oil based finish is not permitted for use in the high rise buildings in the city. 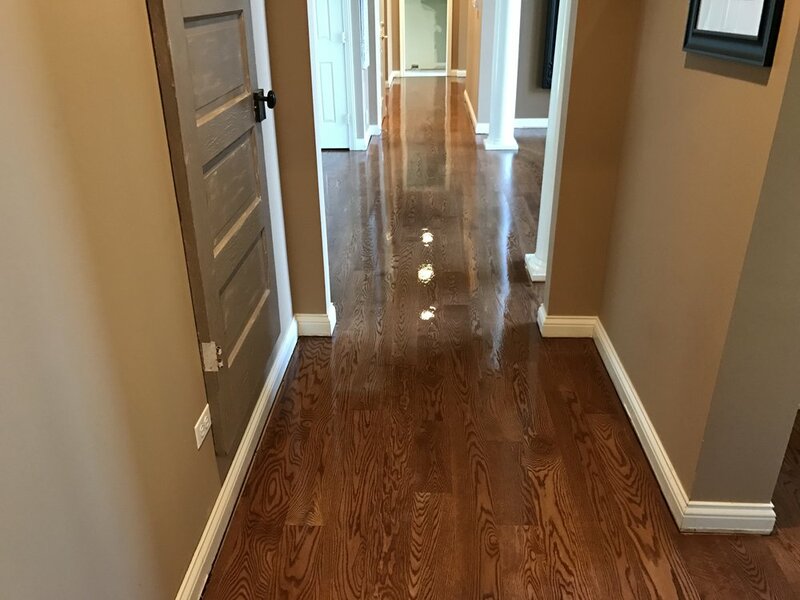 We again used our trio sanding process and finished the floor with a sealer coat of Pallmann X Color to bring out that beautiful stain color and then topped it off with two final coats of Pallmann x96 water based finish. Of course, the customer was thrilled with how everything turned out. See the results for yourself down below. Project Details - We had a customer that really loved the color red. He wanted to get as much of a red color as possible without making the floor too overpowering. We suggested Red Mahogany from the Bona DriFast line of stains and he immediately fell in love. 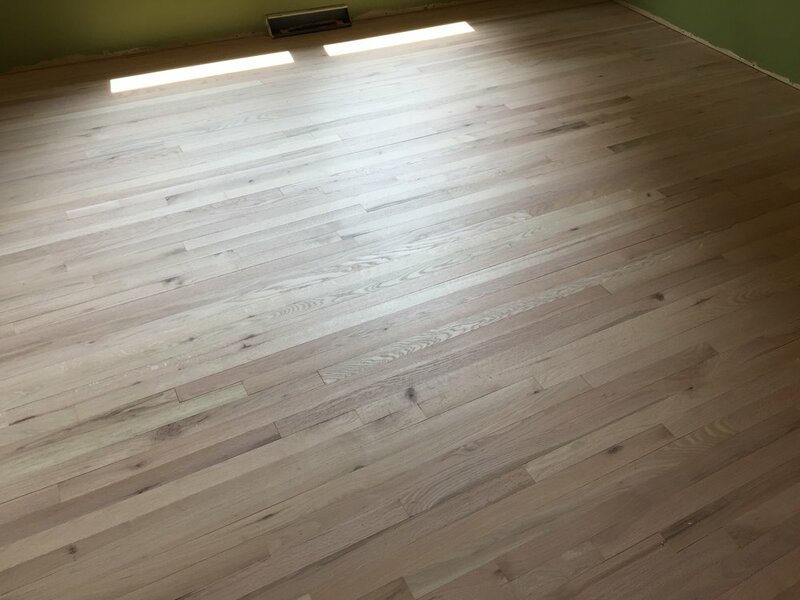 The current floors he had were in very rough shape so it took quite a bit of work to get them sanded up and flat, but after that stain was put down, they regained any beauty that they may have lost over the years. 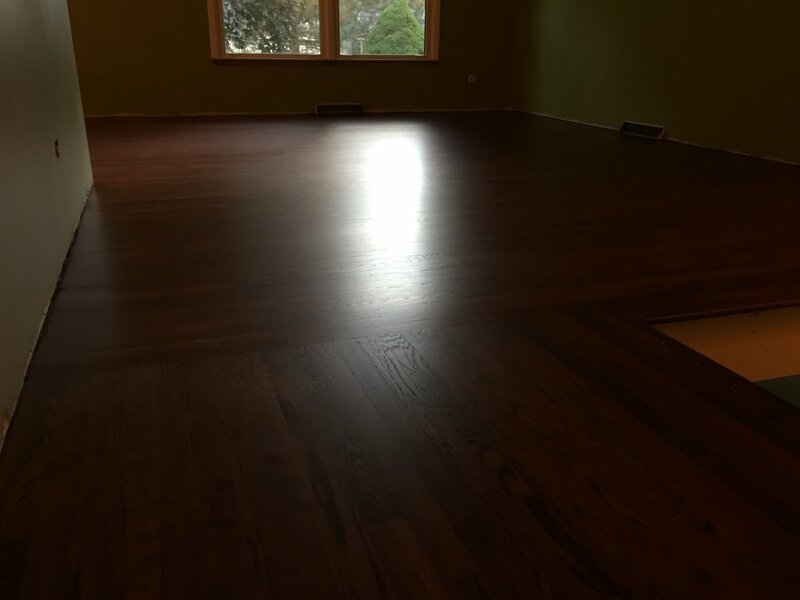 The floor was finished with one coat of EasyPrime finish from Loba and 2 top coats of Loba EasyFinish which is the new water based finish product we use. The customer was thrilled that they were able to get back onto the floor the same day we finished because of the quick dry time. 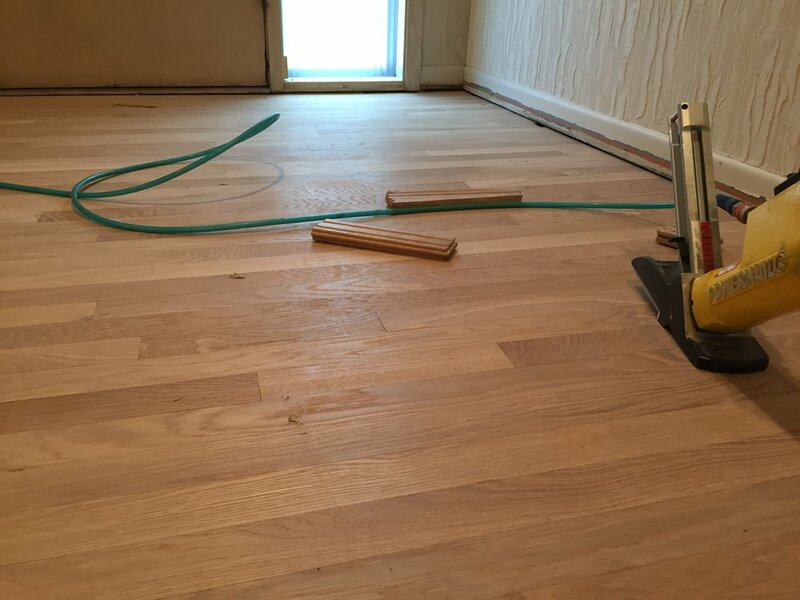 It may seem like a small thing, but having the floors dry this quickly can greatly reduce project time. Finishing a project a day or two early is something to take into consideration when choosing your finish. Project Details - This particular project was for one of the contractors that we do a lot of projects for on the North Shore. The home had old flooring on the entire first floor but was all carpeted on the second floor. We removed all of the carpeting and installed new 2 ¼ Red Oak Hardwood Flooring on the entire second floor. 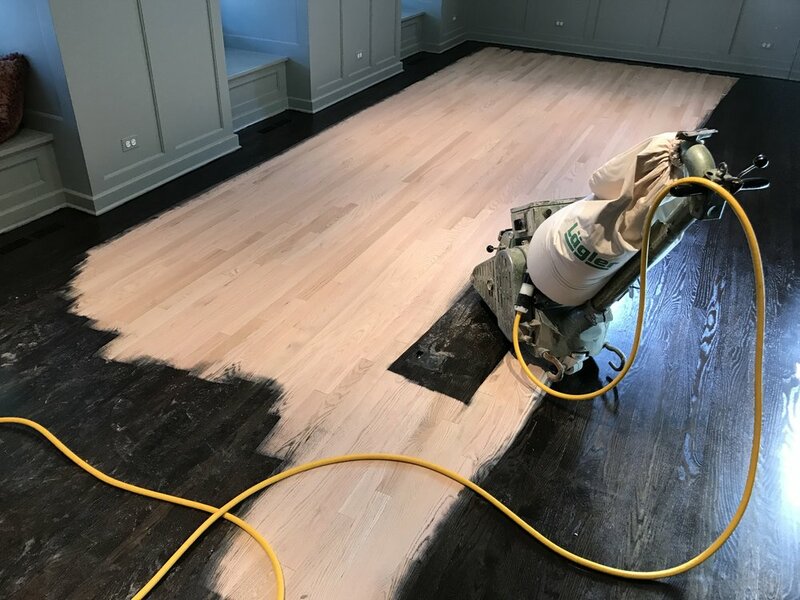 After the installation, the entire floor was sanded flat using our special trio sanding process and then stained with Bona Graphite from Bona DriFast line of stains. 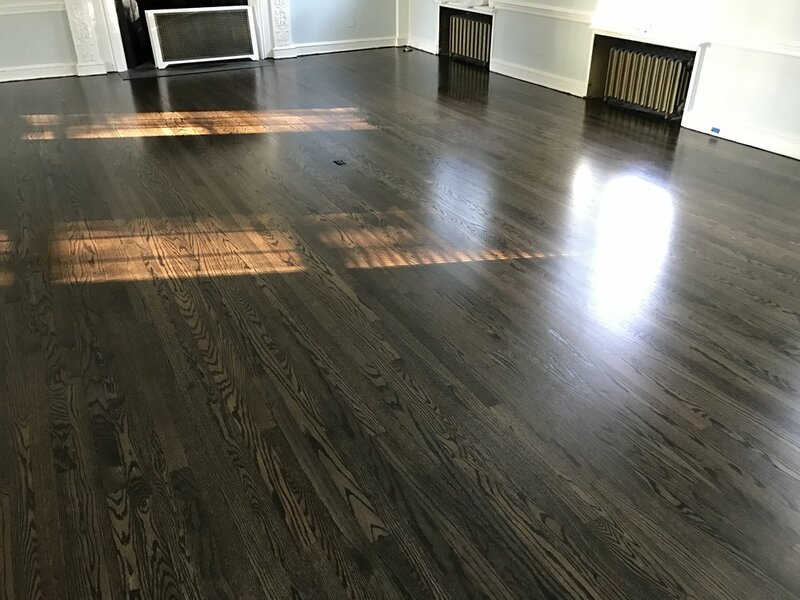 The floor was then finished with our standard oil based finishing process since dry time was not a concern as there was more work to be done in the home before the owners would be moving in. Project Details - This was a rather large job that was going to be challenging for us from a technical perspective. 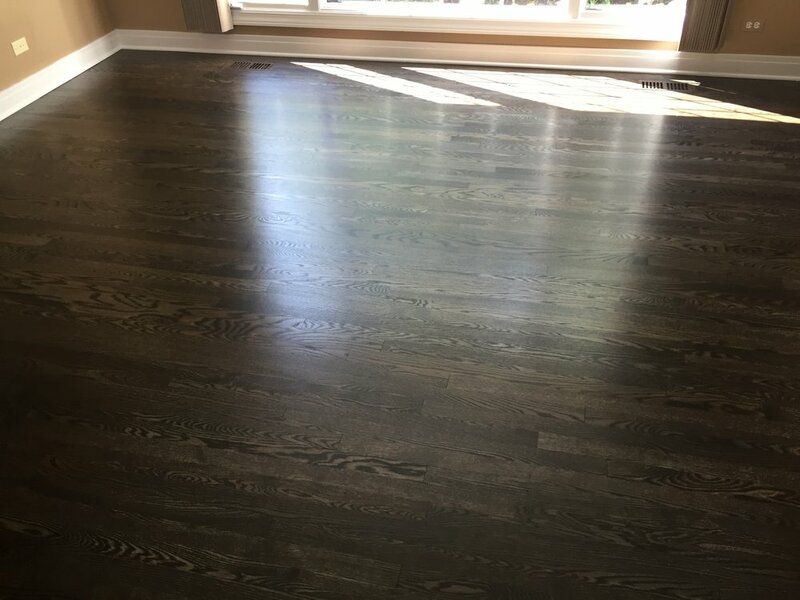 It's not common to have something like Ash stained dark, but the customer made the decision that they were ready for something a little darker in their home. Our customer decided to go with a water based finish for this project. 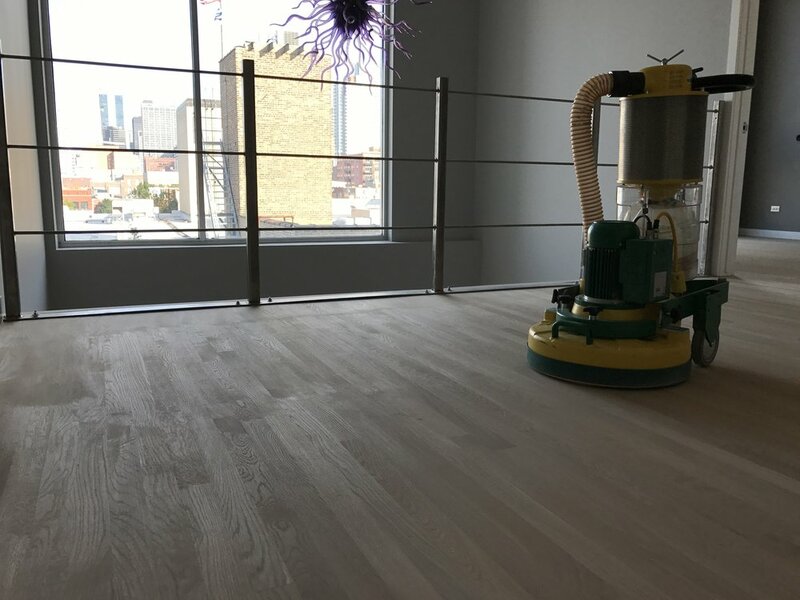 They were planning on moving in soon after the floors were completed and did not want to deal with the longer dry times or lingering odors that are often associated with oil based finishes. They wanted something a bit more durable, so we applied Pallmann X98 water based finish. This is a two component finish meant for heavier use because it provides more substantial scratch resistance. Project Details - A natural finish can really go a long way. We often tell our customers that a stain isn't necessarily always the best choice. Wood is a naturally beautiful material. Our client decided to go the natural way and was really thrilled with the results. It was a pleasure working on this project. The homeowners had no idea what to do with their new home. They had hardwood flooring running around the outside of the room however there was a carpet inlay in the center. We suggested installing a nice exotic wood that would really stand out into the center and removing the carpet. We ended up installing the Brazilian Cherry and finishing it with oil based finish. 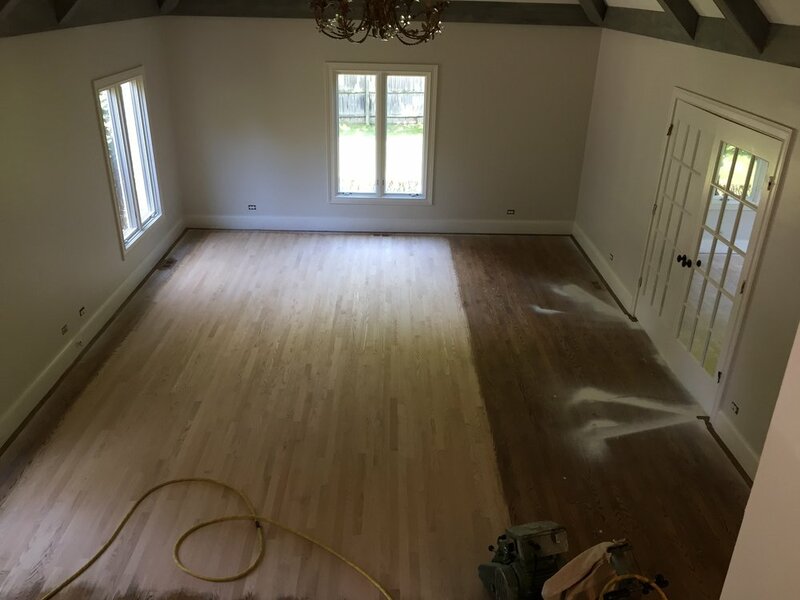 This was a rather small area so the homeowners were not very concerned about fumes or dry time, and we think the oil based finish was an excellent choice as it will really bring out the red nicely over time on the brazilian cherry. It's not often that we get to work with an exotic wood like Brazilian Cherry, so this was definitely a treat for us. Brazilian cherry is just one of those woods that's going to look fantastic without any type of stain. It really makes an impression if you see this wood in person. We were impressed with how well the oil based finish suited the room that this Brazilian Cherry was in. 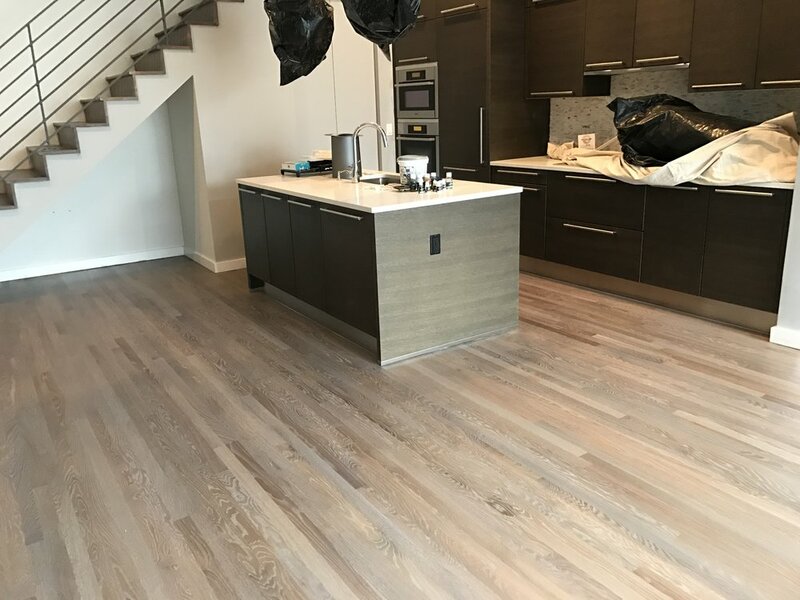 Project Details - Trends in hardwood flooring are incredible; we find that some popular trends can make their way across neighborhoods very quickly. 2015 AND 2016 were definitely the year of dark walnut. This particular shade of stain was very popular with many of our clients throughout the past couple years. We can definitely see why. This dark stain makes an immediate impression. There is definitely a formality to it that a lot of our clients clearly enjoy. While the stain may be very uniform, we did find that a lot of customers were split on what type of finish they wanted with their dark walnut stains. This client chose to go with the oil based finish and we think it looks great. The customer was naturally satisfied with the results which you can see for yourself below. 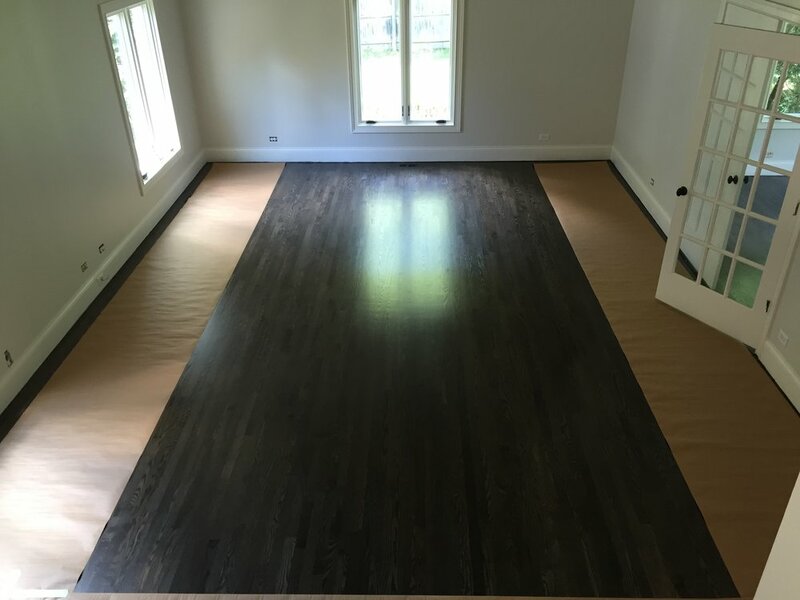 Project Details - This particular client just purchased a home in Chicago, but was disappointed that the entire home had carpet. 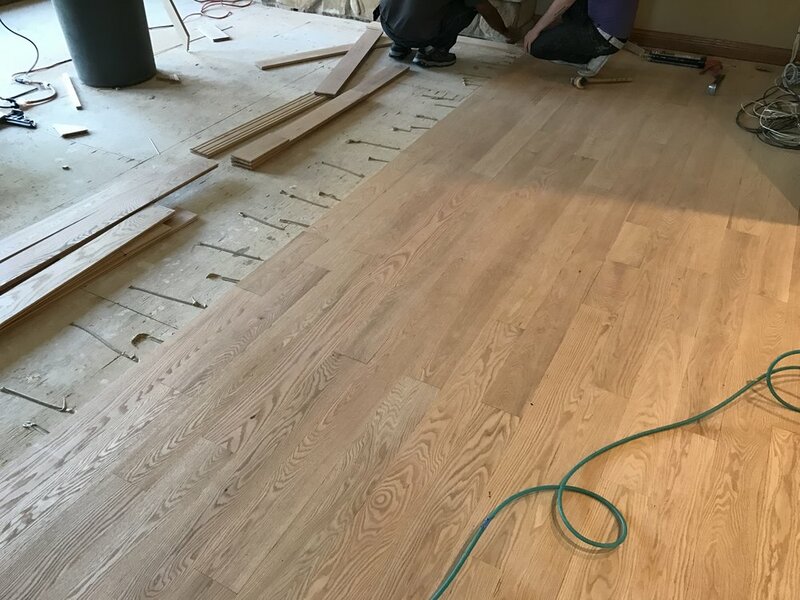 They chose to remove and replace the carpet with a brand new White Oak hardwood floor. This particular grading of floor was Common #1, as you can tell by all of the grain variation in the boards. We thought it would work really well with the space. The customer chose an English Chestnut stain finished with our standard oil based finishing process. Drying time and fumes were not a concern as they were not currently living in the home, so they opted for the oil based finish as they were also looking forward to it ambering over time. Project Details - This refinish job was a great quick little project of ours. The client wanted to go darker than what was already in the room before we got there, so we suggested some samples. The client ultimately ended up choosing to go with the red mahogany stain with an oil based finish. There are definitely hints of red in this stain which is not a color you're going to see in a lot of the floors we do besides something like a Brazilian Cherry. The client was ultimately satisfied with her choice despite being uneasy with the stain choice towards the beginning of the project. It was a pleasure working with these floors. Take a look at our work here down below. Project Details - We are particularly happy with how this project turned out. The dark walnut was a color that we are deeply familiar with. The client was actually referred to us by someone who had their floors done through Plus Hardwood Flooring in the past. They chose dark walnut for their stain color as well! 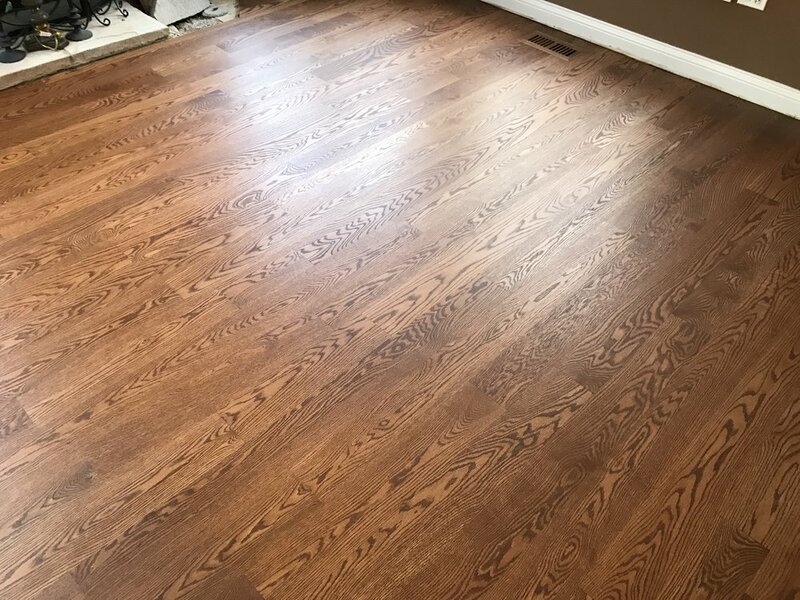 There was one room that had prefinished flooring in it that the customer also wanted refinished. Though, many prefinished products have beveled edges, we decided that would not stop us. Instead we decided to re-handscrape all of the grooves and edges of the floor to re-highlight these features and the customer was absolutely thrilled with the outcome. The client was a joy to work with and it really makes the entire process so much smoother. Good communication between us and the customer is always something that is going to make the job more enjoyable. The client chose the water based finish option which you can see in the pictures down below. We think the entire project came together in a way that really makes the space special. Project Details - This client chose to go with a natural look along with a water based finish. This level of simplicity can leave an incredible impression on nearly anyone. Wood is a naturally beautiful and functional material. Showing off that natural beauty by choosing to not go with a stain is a really admirable choice. The fact that a water based finish was chosen as well ensured that the floors look as natural as possible. 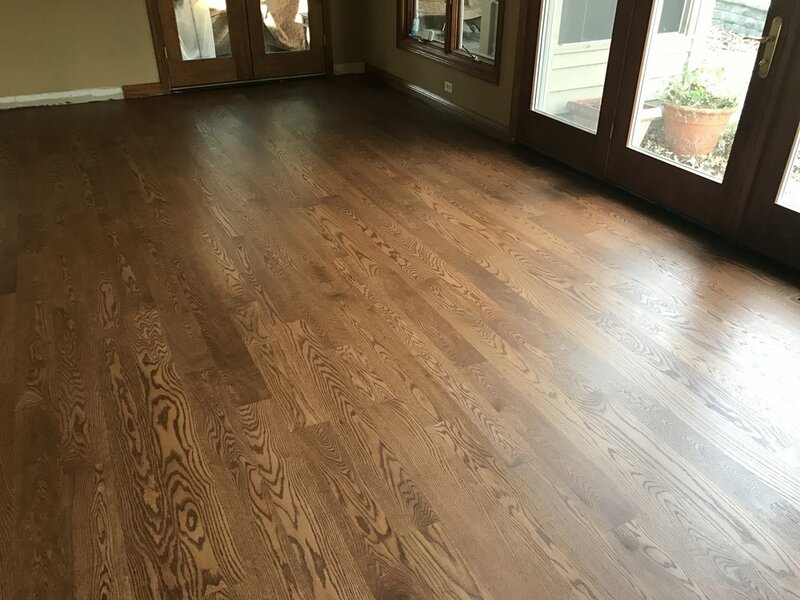 An oil based finish may have ruined the look of these "natural" floors by adding an amber tone that would distract from the natural beauty that the floors exhibit. Take a look at the photos down below and judge for yourself.